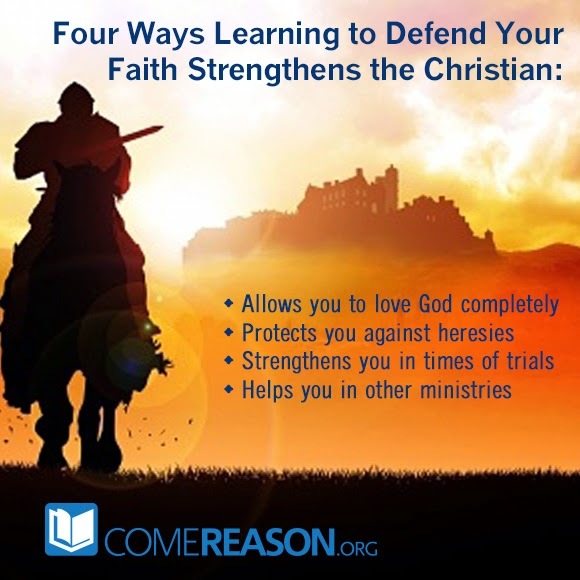 Four Ways Learning to Defend Your Faith Benefits You! Last week, I wrote a blog post saying that if you want to love God in the way Jesus commanded, you need to get serious about loving Him with your mind as well as your heart, soul, and strength. Part of that means we as Christians need to better understand what it is we believe and we need to be able to defend our beliefs. But many people think that studying apologetics is akin to being on the school debate team; it just prepares you for face-off against opponents and helps you win debates. That's really a shallow way of understanding why learning to defend your faith is important. I can see at least four different ways learning apologetics can benefit you personally in your walk with God. I will tackle the first two today, and address the second two tomorrow. I want to draw a big line under one item here. Loving God intellectually doesn't mean you're simply equipping yourself to win an argument — it means you've studied His word carefully and thoughtfully. God isn't holding us accountable as to whether we convince others of our point, but if they are "ready on our lips" and if we can "accurately handle the word of truth" (1 Pet.3:15, II Tim 2:15). Studying God's word changes us! Paul furthers this point in Romans 12:2 when he writes, "Do not be conformed to this world, but be transformed… by the renewing of your mind." We are transformed when we begin to understand and believe correct things about God. But just as we said to the critic, we can only be sure ourselves if we're holding right beliefs if we study them and make sure they are true to His word and His creation. Another important function of using our minds to love God is it protects us from falling into heresies or theological error. In fact, many of the cults that we face today actually have their origin in the early 19th century in Western New York in what was then the rugged frontier of America. There were many revival movements that would come and go and the itinerant preachers would really get people worked up; they would call the masses to repentance and many would respond to be "saved." But the movement was rooted only in an emotional appeal, and not intellectual rigor.1 Emotional response without understanding doesn't lead to true salvation, but a façade of true belief. It's no wonder, then, that the cults sprang up in the same area. The roots of Mormonism, Jehovah's Witnesses, Spiritism, Utopianisim, and other cultic beliefs can all be traced to this drive to find religion divorced from careful study. We are not immune to such corruption of Christian beliefs even today. One extreme example is the word-faith movement. These teachers are spreading all sorts of heresies, from teaching that God has a material body to the supposed existence of a "force of faith" that even God must obey. Duped followers take it in willingly, without understanding how much they have corrupted even the most basic Christian doctrines. But, what other false ideas may have begun to thrive as a result of our unwillingness to engage our minds? In Acts 17, the Bereans were commended for not merely believing Paul and Silas' message, but they were "examining the Scriptures daily to see whether these things were so." This is why Paul warns us to "examine everything carefully; hold fast to that which is good." (1 Thess. 5:21) This is the way we begin to protect ourselves against heresies. 1.In her article "A Crusade Among Equals" Janette Bohi notes the approach to the Revivalism spreading across the frontier was a mixture of emotionalism and patriotism in the early nineteenth-century. She writes "These early nineteenth-century revivals put the principle of churches being supported freely by their members (volunteerism) before liturgy, democracy before orthodoxy, and emotion before intellect. By crossing denominational barriers, they enabled the church to reach the masses. They made camp meetings a social institution which supported manifest destiny." Missionaries were trying to bridge denominational boundaries and spread the movement across the frontier, but the result was it stunted the importance of being critical and holding to orthodox beliefs and substituted compromise for truth. For more see Bohi, Janette, "A Crusade Among Equals", Eerdman's Handbook to the History of Christianity, Tim Dowley, Ed. Grand Rapids: Wm. B. Eerdman Pub 1977, p.534.